It took 25 years for Frans Ciappara to revisit Giovanni Nicole Muscat’s riveting story of 300 years ago. This is most welcome. Ciappara’s first essay in 1993 had drawn out of the long grass the fascinating figure of Muscat (1735-1803). 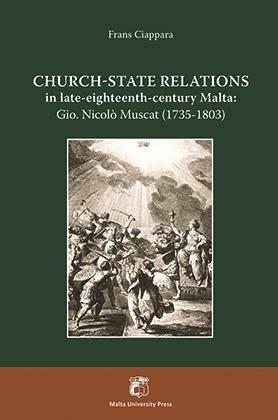 It was a stimulating piece of research that had to be pursued, as Ciappara now does with his new publication, Church-State relations in late-eighteenth-century Malta (Malta University Press, 2018). Perhaps the wait was too long in the coming. Ciappara seems to have hoped that someone should have taken up the prompting and delved further. None did, it seems. As for me, since then I have always included Muscat in all my lectures which touched on the subject and also in some publications, always referring to Ciappara’s absorbing essay. I would have loved to carry out some extensive research on Muscat’s biography but time and other interests unfortunately led me away. I regret it deeply. I submit that this is a need which is still felt. Though Ciappara’s new book is undoubtedly a work of distinction in many ways, the biographical part is direly lacking. It seems that Ciappara opted to focus away from Muscat’s live-history and concentrate solely on his work. This, of course, has it merits. Yet, it leaves something vital missing, especially if Ciappara hopes, as he seems to do (p. xix), that Muscat will perhaps one day become part of the public imaginary. It would take more than a first-class academic exercise for this to happen. What is certain is that Ciappara provides ample material for a researcher to start off a biographical project that would perhaps make Muscat more lifelike, approachable and even loved. If I am not mistaken, the main single new biographical information provided in the new publication is the date of Muscat’s death (p. 237), though even this is given as if just in passing and with scanty additional details in a mere footnote. Indeed, a reader with a biographical interest in Muscat would be much disappointed. He would discover that, in this respect, the 1993 essay is improved upon very little, if at all. For instance, an otherwise important photograph from some Status Animarum (the source is unclear: what is ‘CEM’?) is thrown in (p. 55) without a single line of explanation as if it was an afterthought. Another significant detail that Muscat owned a slave is simply dropped in in a footnote with no comment at all. Notwithstanding this deficiency, the new publication is a top-notch research that throws invaluable light on the administrative and governmental underpinnings during the latter part of the 1780s and the early years of the 1790s in Malta. With regard to Muscat it greatly expands and clarifies the 1993 essay by providing an extensive background to his working ideas, his writings and his efforts to separate State from Church. Ciappara’s book can be mostly appreciated in its details, its precision and in the minute examination of the intricacies involved in Muscat’s work. Ciappara, of course, stands up to his reputation as a first-rate researcher. His painstaking efforts are evidenced throughout the book from beginning to end; in particular not excluding the disclosure, I think for the first time, of Muscat’s Istoria Apologetica (p. 238). Apart from all documentary evidence, Ciappara’s book draws quite clearly two essential features that do much justice to Muscat’s personality and contribution as much as to Ciappara’s fine sense of perspective. Firstly, that Muscat represents the culmination of a process that had begun almost half a century before and included worthy people such as Fabrizio Grech and Antonio Micallef (p. 240), both still largely unknown personalities. Secondly, that Muscat was part of a European movement which involved almost all the sovereign states of the time (p. 184). These two elements enliven Ciappara’s entire book and feed his theoretical structure. One feature which must be held to be highly debatable is Ciappara’s claim that Muscat “was more of an official and administrator than a radical philosopher” (p. 241). I submit that Ciappara actually contradicts himself on this score for at various points he puts forward the idea that Muscat was a philosopher (p. 246, for instance). Of course, this cannot be understood in the way we understand philosophy today but surely it holds water in a late-18th century sense. Whether Muscat was a “radical” philosopher is another matter. Perhaps not. His absolutism is a case in point. Ciappara clearly tenders (pp. 77, 80) that Muscat did not seek a separation of State from Church on the basis of the individual’s sovereignty, as some contemporaries did, such as David Hume, but on the belief that the territorial ruler was absolute in his power and sovereignty to the point of being above the law. This point might not have been appreciated enough by Ciappara when dealing with the secular State in Malta subsequent to Muscat (p. 235). All in all, Church-State relations in late-eighteenth-century Malta is a captivating book which every reader of Maltese history in general, and political philosophy in particular, should not miss. Of course, minding Giovanni Nicolò Muscat with special consideration by all should take pride of place. Quite justifiably, in my view, for he was a most intelligent, courageous and brave upholder of independence of thought and action. It is unfortunate, as Ciappara rightly notes (p. 243), that he never gathered a following around him to keep his flame blazing. Ciappara, on the other hand, with the full force of his erudition and insight, comes through as an academic whose work commands attention, as always. Muscat may have been kicked into the long grass for too long but, thanks to Ciappara, this might now be something of the past.